We are Oakville’s gutter repair experts and have been providing our services for more than a decade. We treat all sorts of gutter related problems. 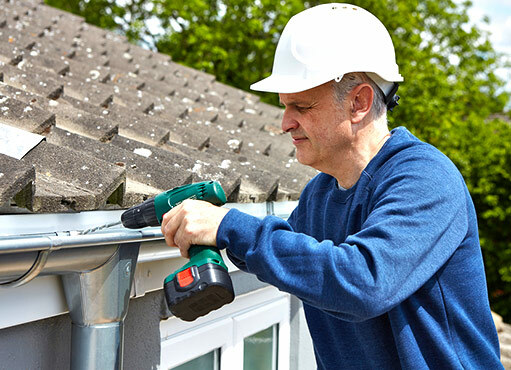 Whether it is a leakage problem due to faulty installation or failed joints, blocked downspouts or sagged gutters, we restore everything to its original condition. Through the tireless efforts of our highly experienced technicians, we have earned the status of the most trusted eavestrough repair company in Oakville. We are secured by full liability insurance and every one of our workers has WSIB coverage. We are dedicated to our work and strive for excellence in it. Gutters encounter many types of failures during their lifespan. Most of these failures are caused by improper installation or corrosion of sections with time. The joints of the gutters or seams are always affected by every type of failure that occurs. The strain on the joints cause seam failure and leakage starts from these failed joints. Seams can be restored by mending affection segments. Gutter seam repair resolves all leakage problems in most cases and is believed to be the most efficient method in dealing loosened joints. Our experts are highly skilled and experienced in seam restoration. Gutter system need proper maintenance just like all other systems in a building. Many huge problems can be avoided by regular inspection and timely maintenance. It also increases the efficiency and lifespan of gutter system. However, if small problems are left untreated, they will ultimately cost more in the longer run. Sagging of gutters is not considered an important problem by many people but, if left untreated, sagging can lead to many severe problems like seam failures and leakages. 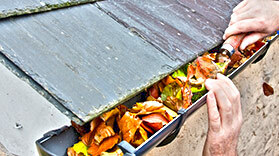 Gutters should be cleaned and inspected at least two times a year. Our experts are experienced in catering sagging and other similar gutter problems. Gutters of large residential or commercial facilities require more frequent cleaning and rigorous inspection than ordinary gutters. Fallen leaves and debris accumulation is a common problem in such gutters which ultimately leads to clogging of outlets. Sagging is also common due to accumulation of water in clogged outlets and weighing of eavestrough due to increased weight. These gutters face many other problems due to their larger area and increased flow. Our experts from NICK’S Window Cleaning provide all sorts of services needed for proper working of residential/commercial gutters throughout Oakville. NICK’S Window Cleaning is the most trusted gutter repair service in Oakville. Our rates are affordable, our quality of work is the best. We complete all work in timely manner. We value our customers. Our customer service is top-notch. We respect our customers and try to build a long-lasting working relation with them. We have the best team of highly trained and experienced technicians. Our workers work very safely without damaging your precious properties and leave a clean environment after work. We also provide a free of charge estimate of the repair work to be done. Gutter and downspout maintenance is very important because negligence in this regard can create many severe problems like flooding or moisture accumulation in basements. However, this work is not easy for a typical homeowner to do on his own. Many people overlook small problems in their gutter systems to save few bucks. But these problems can turn into severe problems sooner or later. Now they are forced to spend more money to deal with them. It is wiser to deal with all problems in the beginning, no matter how much small they seem. Many people try to repair their gutter by themselves, some for the sake of saving money, some for sheer thrill. We will advise you to never act on your own without consulting any professional. You do not have right tools and knowledge for this process that is why you can end hurting yourself or damaging your property or create more costlier problems. Simply hire some professionals for this dirty and risky work and let them do their job. Trust Us For Your Work! We are an established gutter repair company having a lot of experience in this field. We have the right men, the right tools and the right knowledge for this job. We make sure that your rain gutters are working perfectly. Trust us for your repairing work, and we will get it done in no time.